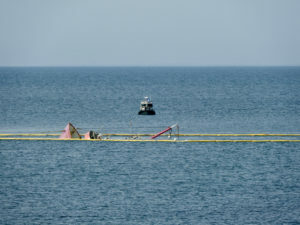 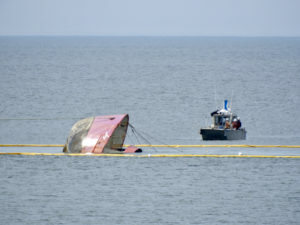 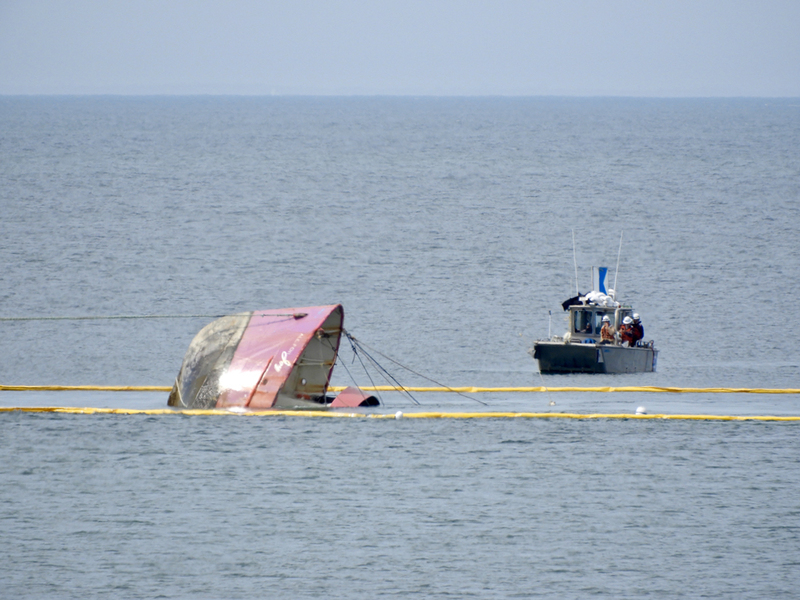 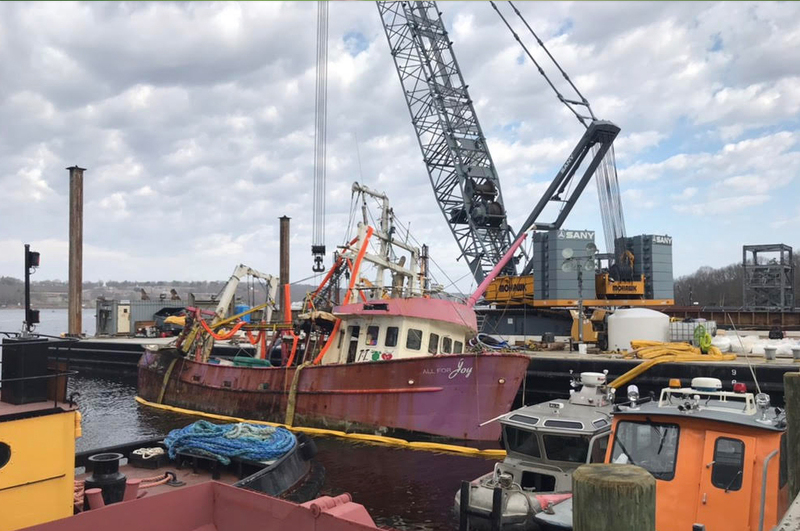 A full report should be forthcoming from the United States Coast Guard and others involved in the wreck situation including how it traveled after capsizing, the fuel leak, salvage operation, and any environmental remediation. 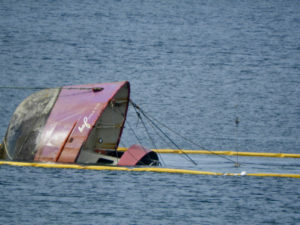 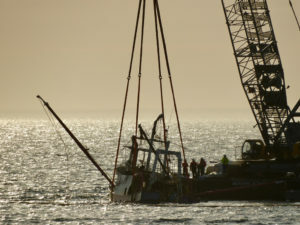 During the 20 days between the capsizing and recovery, many individuals were making observations, keeping notes, sharing information, and taking photos to document the event and any progress toward a resolution. 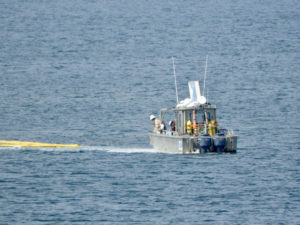 It was a tremendous help! 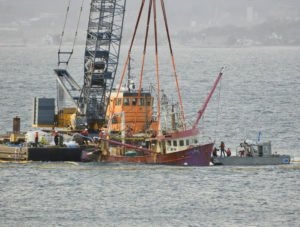 The Fishers Island community thanks everyone involved including the USCG, DEC, ACOE, National Oceanic Atmospheric Administration, NY Department of Environmental Conservation, NYS ENCON Police, MER, Mohawk Northeast; the divers of Mainstream Commercial Divers out of Kentucky and a division of MER of Randolph, MA; Clean Harbors, Sea Tow, and Global Diving & Salvage, Inc., Fishers Island Ferry District (FIFD) Manager Geb Cook, FIFD Marine Ops Manager RJ Burns, the FIFD Captains that kept a log of the wreck location (to make sure it wasn’t moving), our NY State Police on duty, Island Naturalist Justine Kibbe in addition to all the Island community members who took an interest, made calls, and asked the right questions.  This photo gallery is a collection of photos from all who would like to share their favorite(s) images. 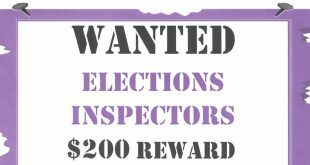 Please email them to finyinfo@gmail.com. Large (up t0 2000px) are welcome. 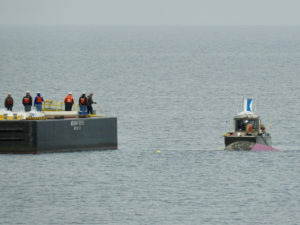 Please note name for credit, time and date, and any other information you would like to include. 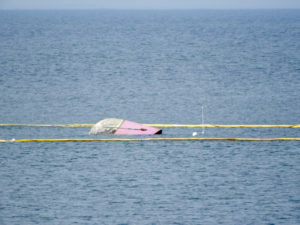 We look forward to filling this album! 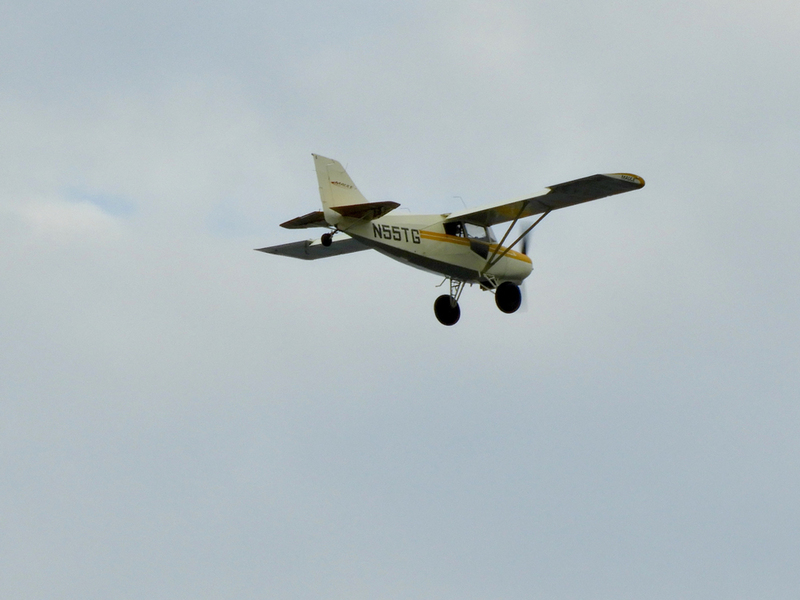 Click any photo to see a larger version of the image or scroll through. 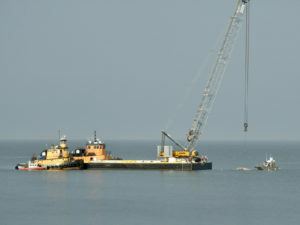 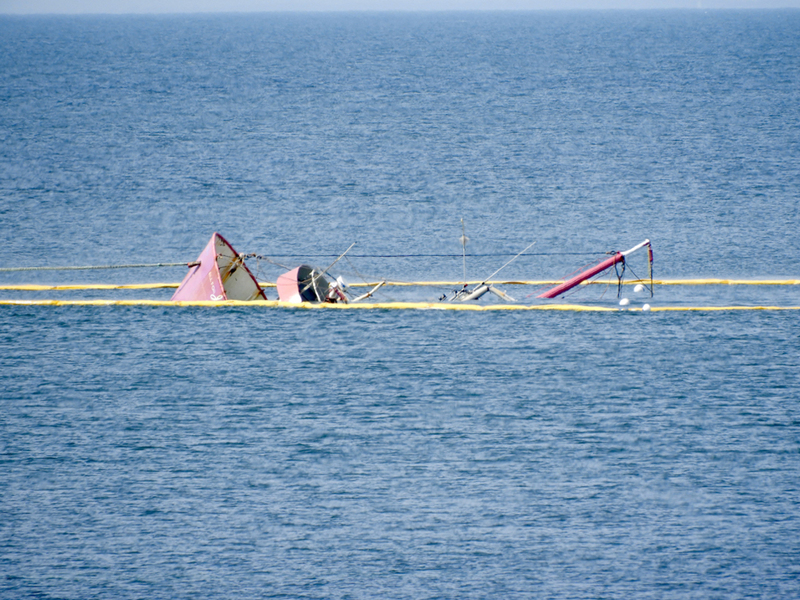 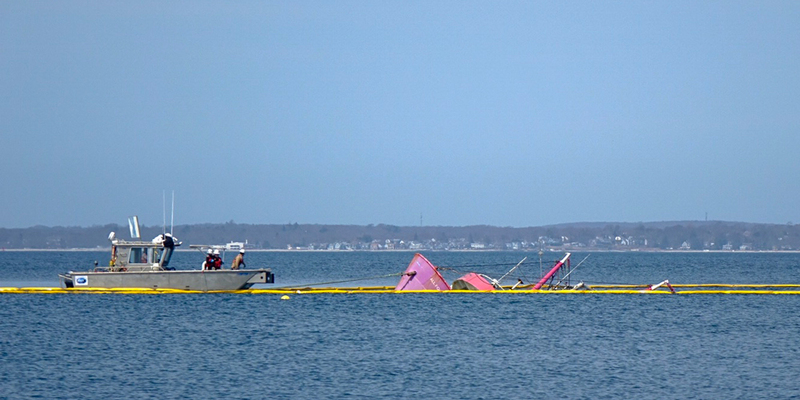 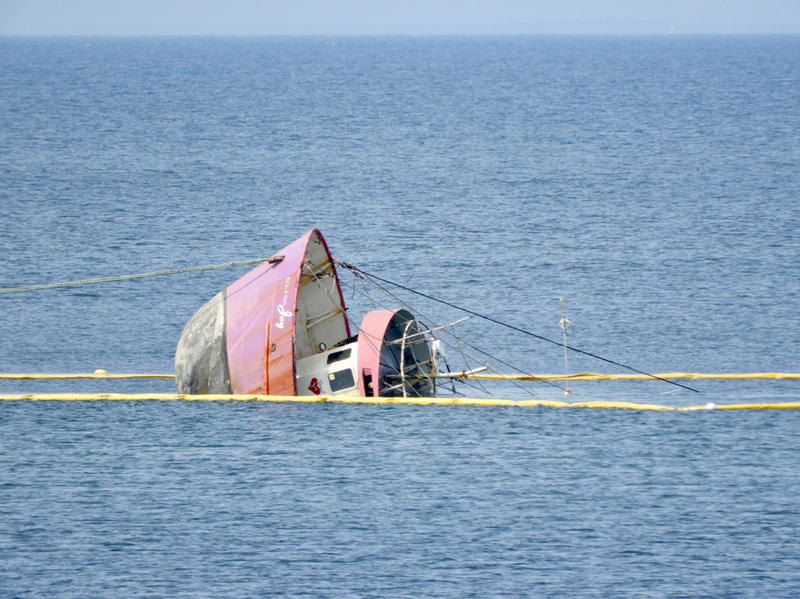 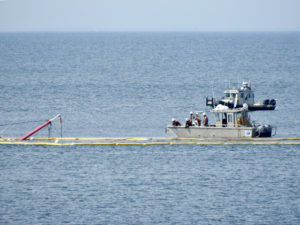 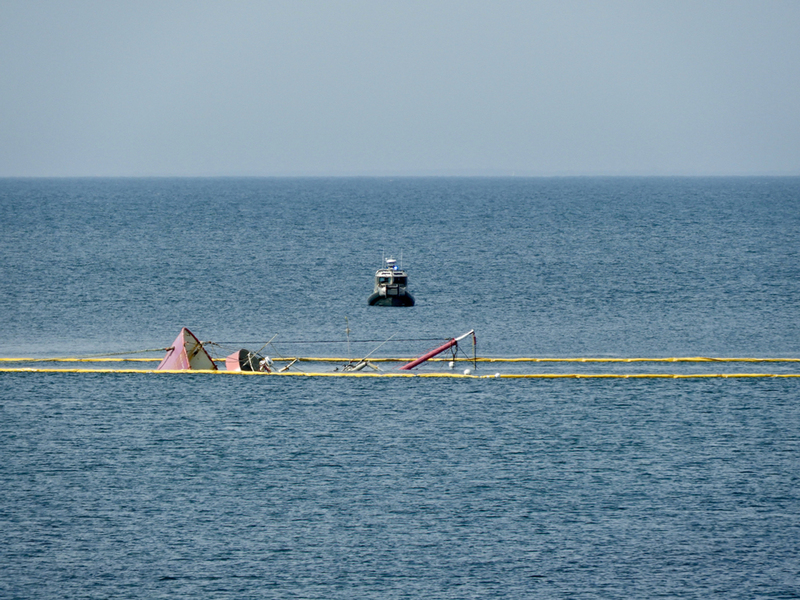 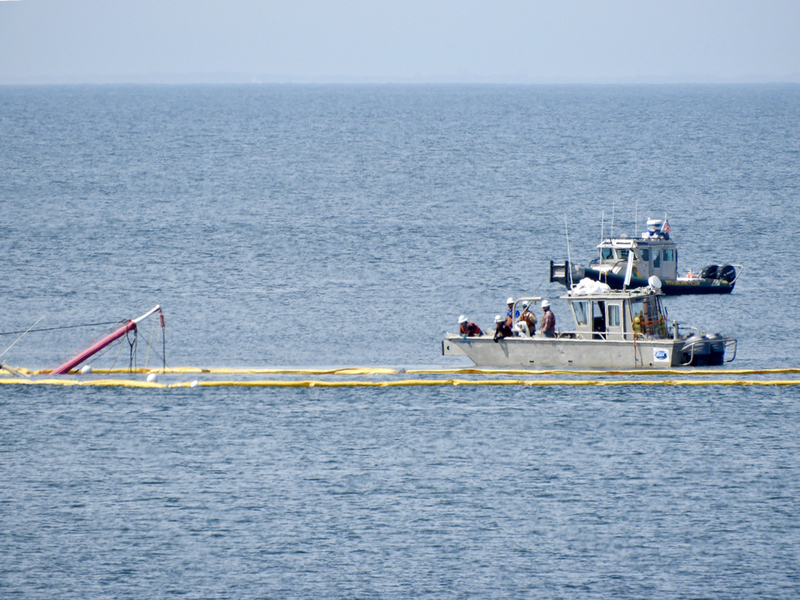 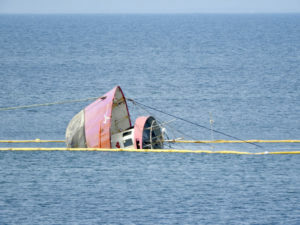 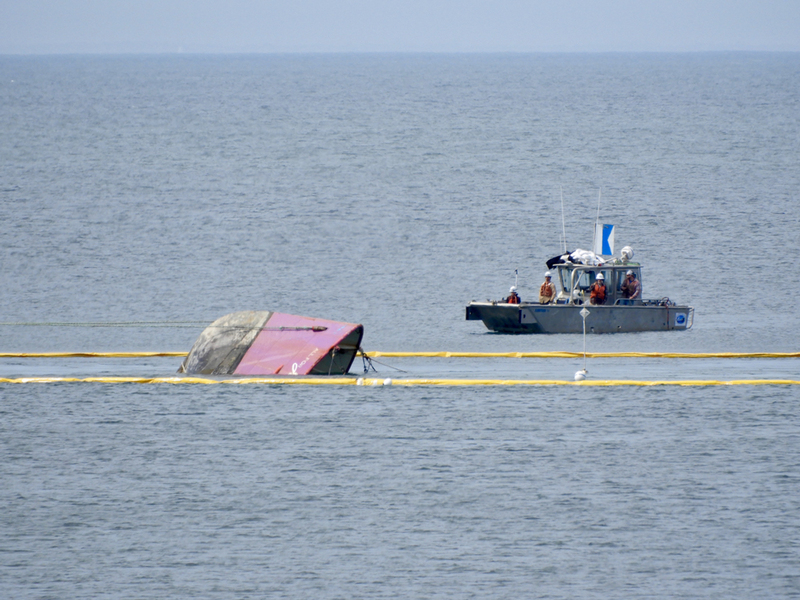 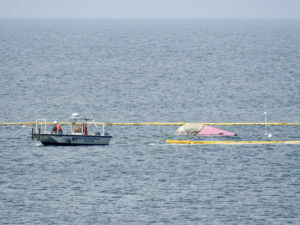 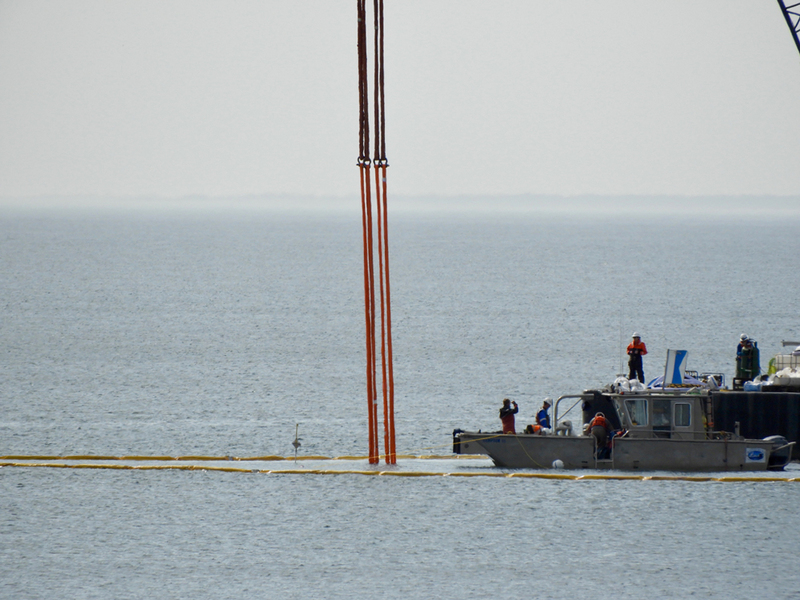 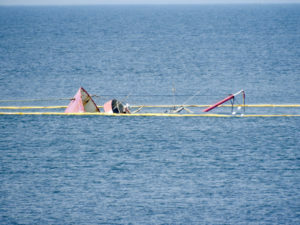 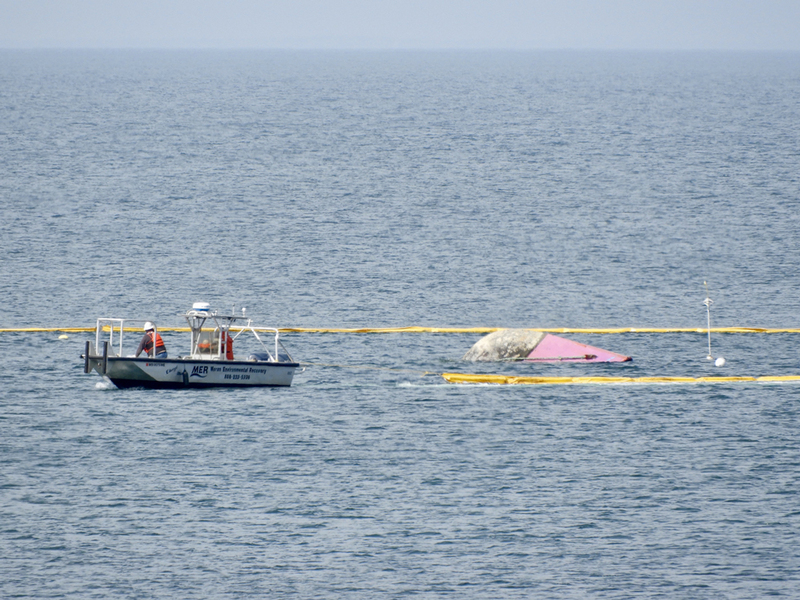 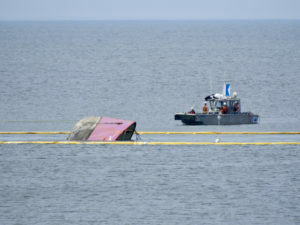 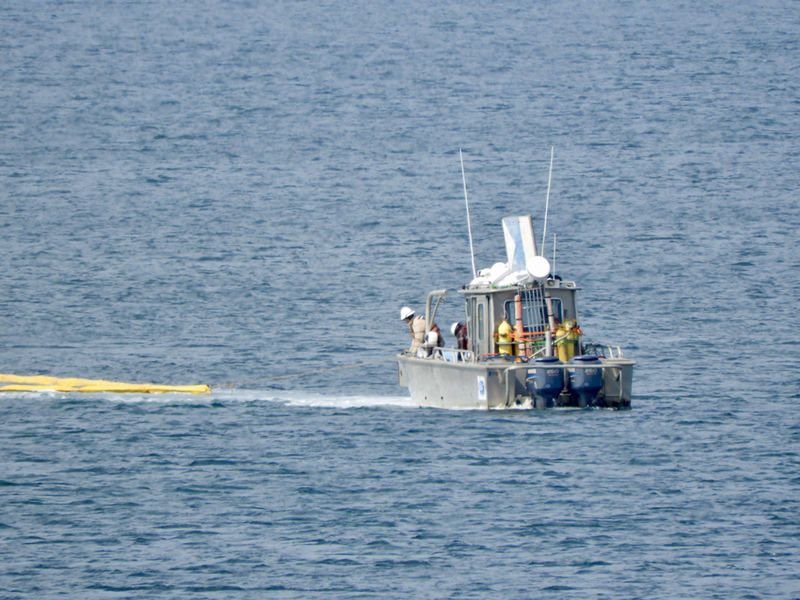 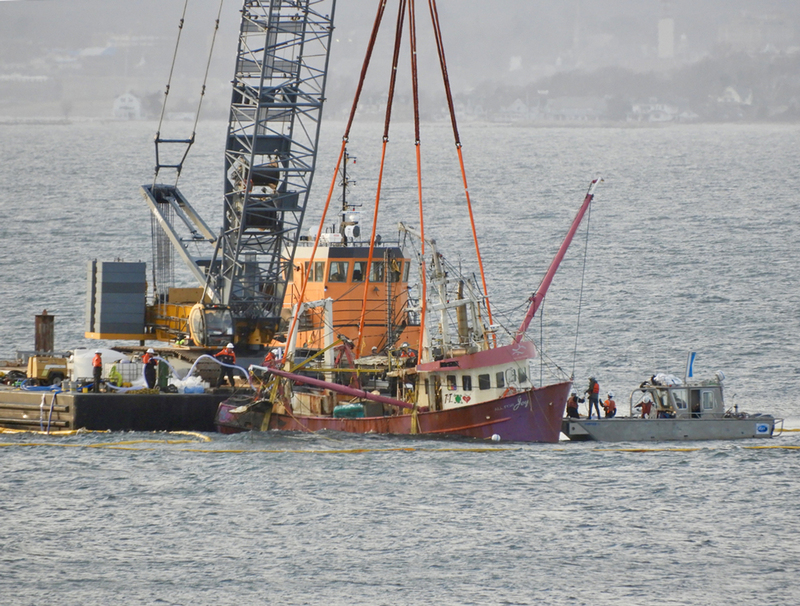 The USCG confirmed that the wreck was removed from Fishers Island’s waters. 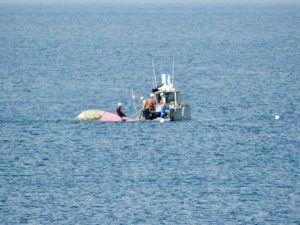 Proof positive! 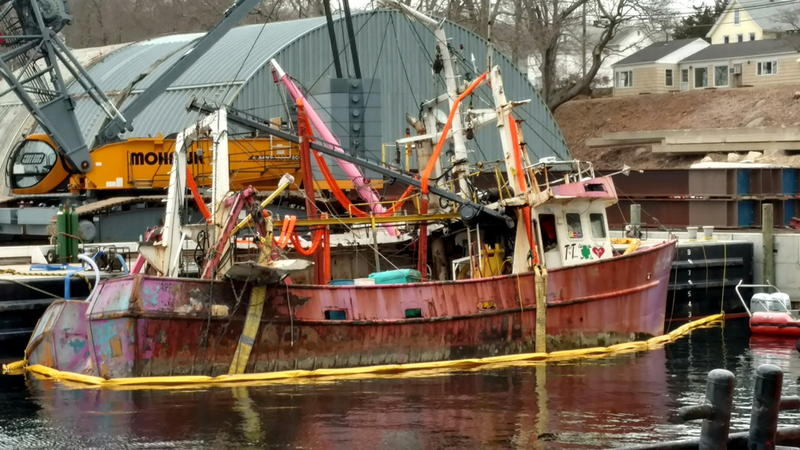 F/V All For Joy 9:10 am 3/31/19, Mohawk Northeast, Thames River, Groton, CT. Photo Credit: Joe & Tracy Brock. 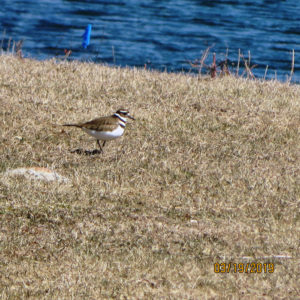 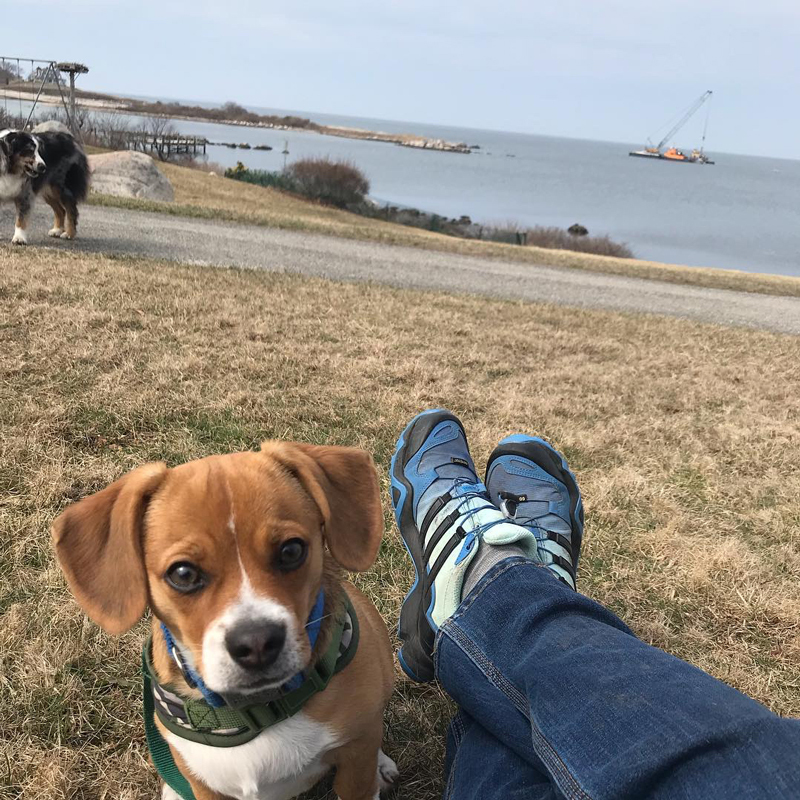 3/30/19: 2:17pm Tracy Brock posted, “Hanging out with my new friend Charlie, watching the salvage of the “All for Joy”! 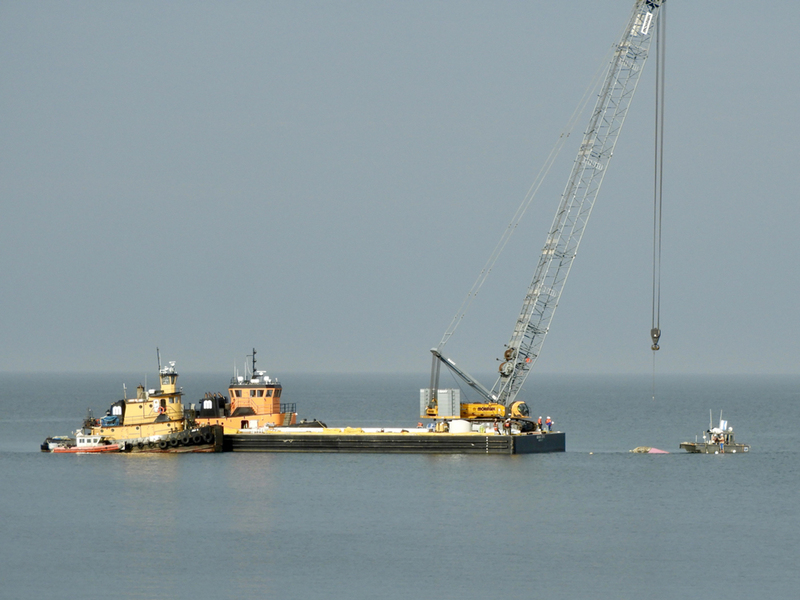 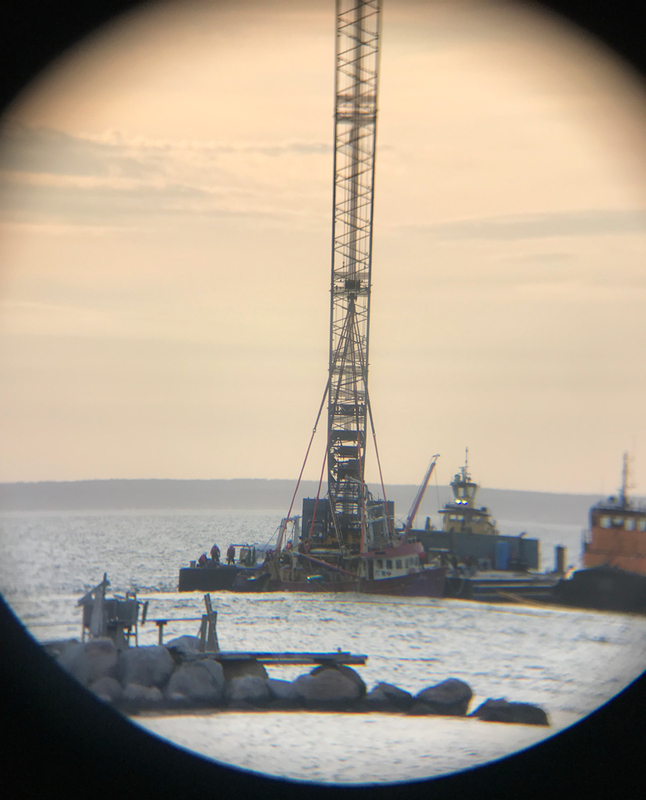 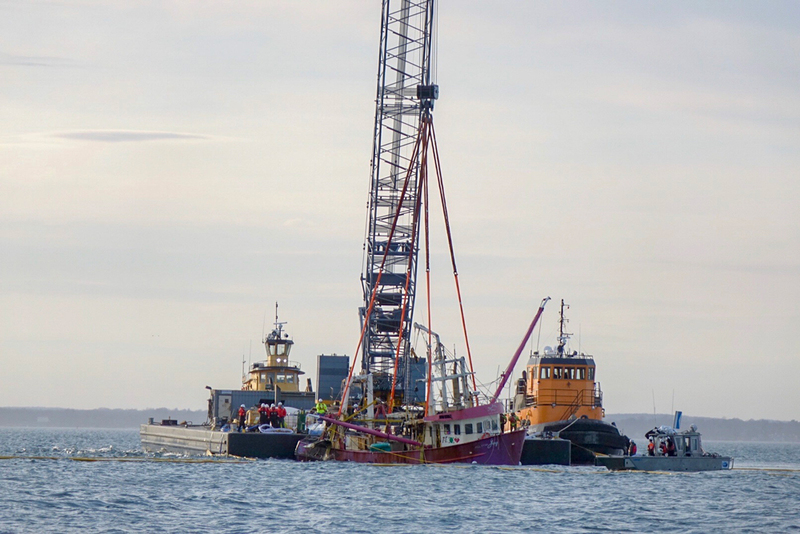 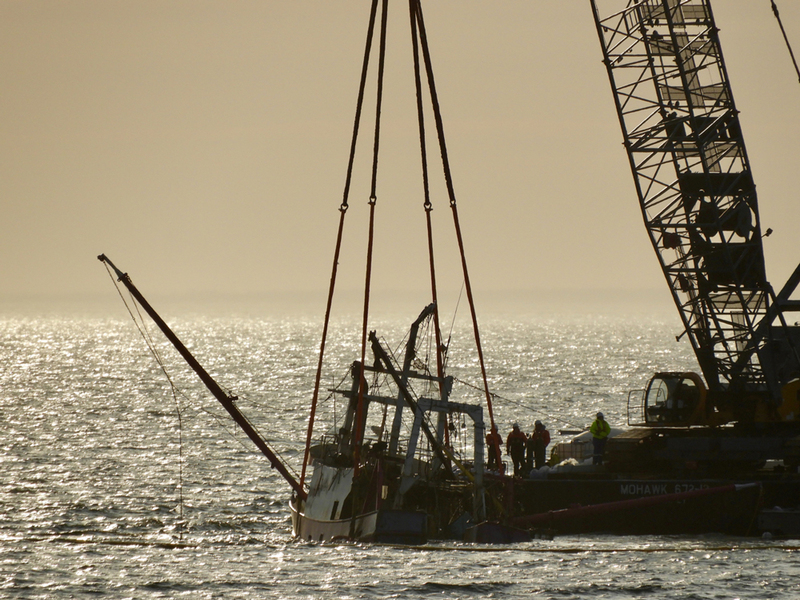 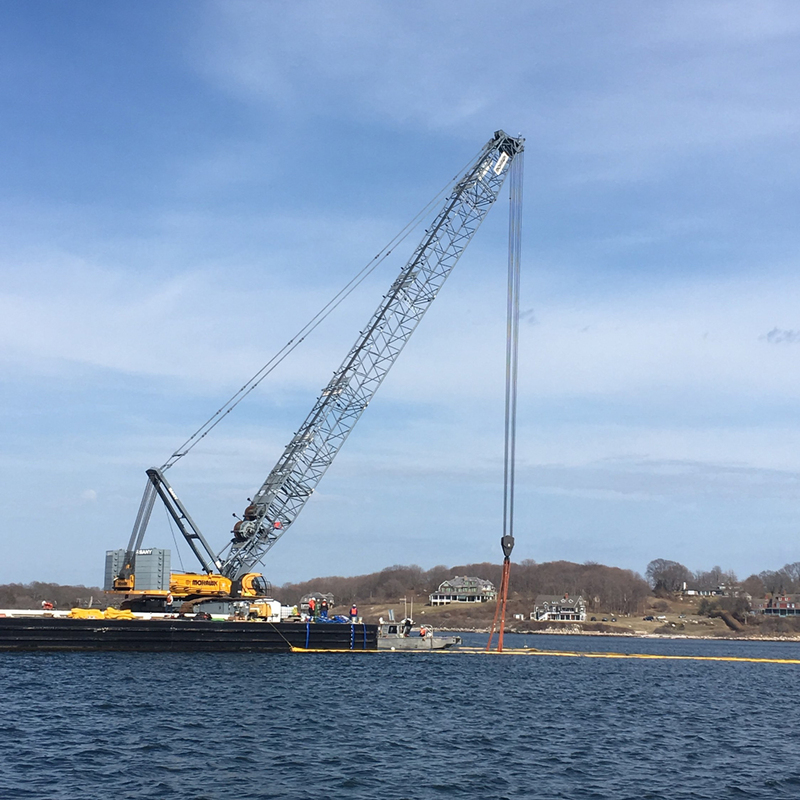 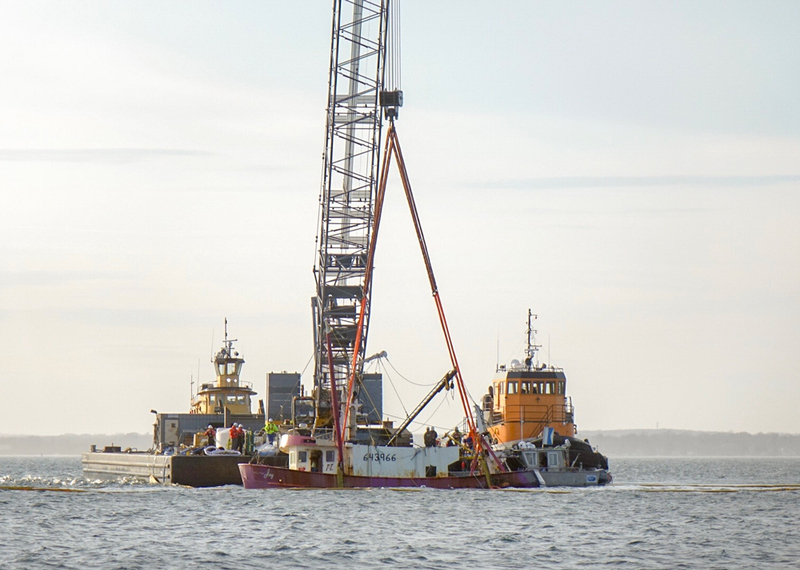 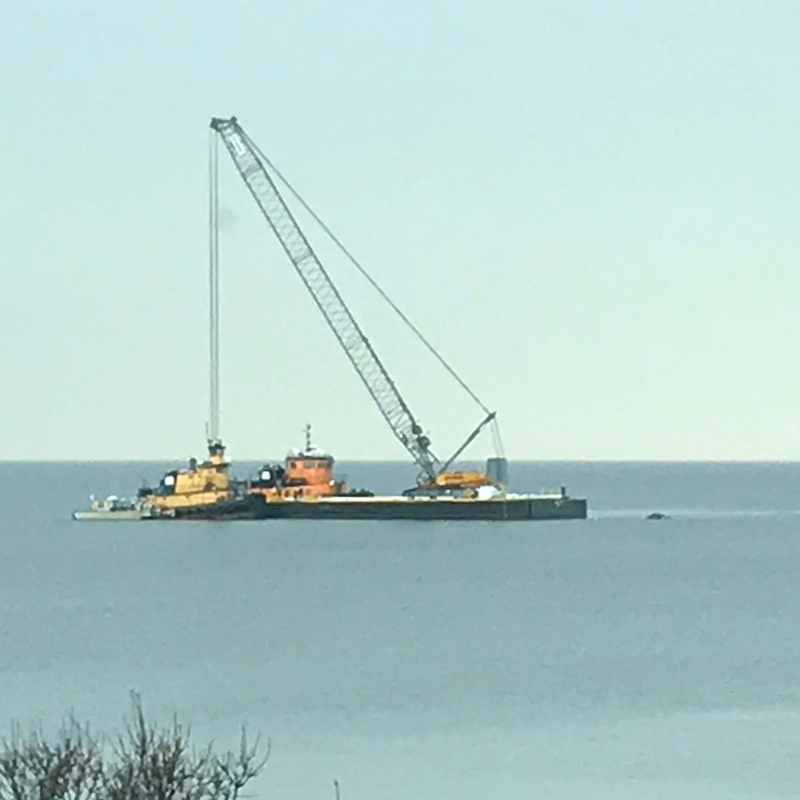 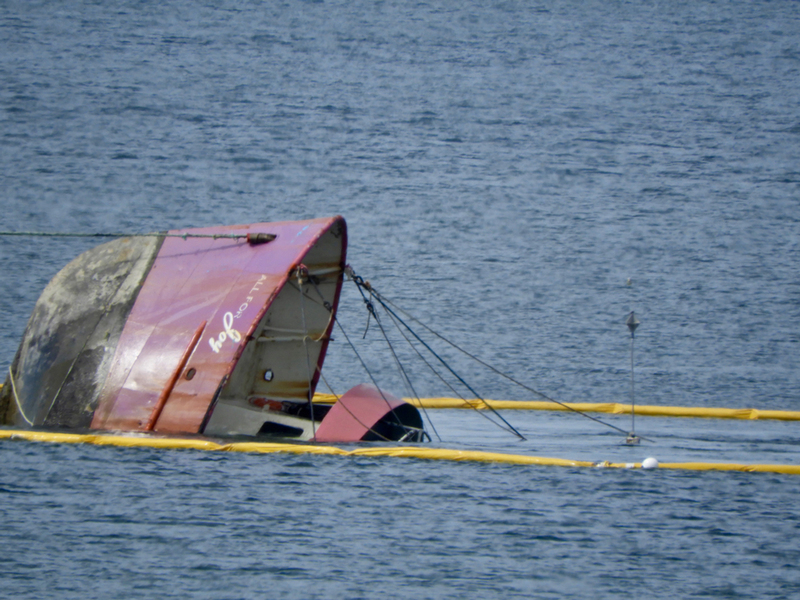 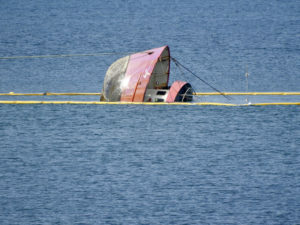 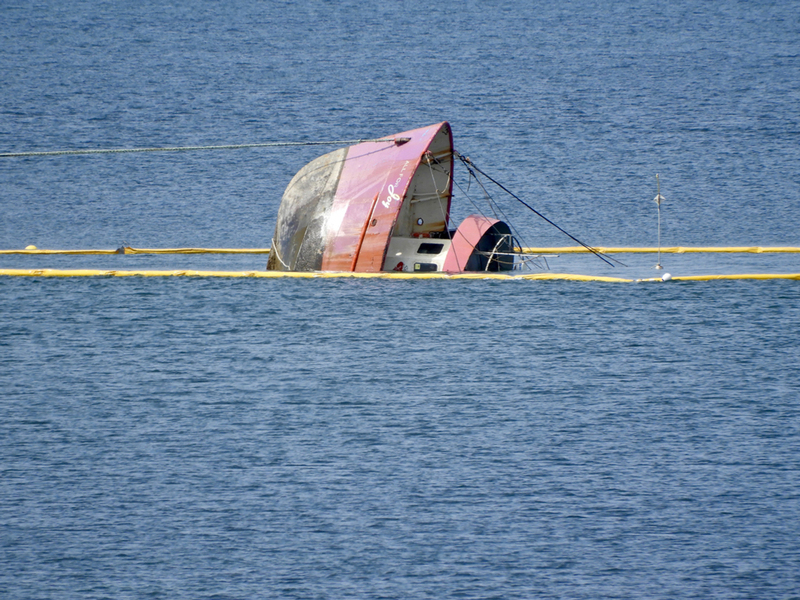 Below recaps the moment – March 30, 2019, the day the All For Joy was put upright by hauling the bow toward the tugs and barge to tip on her stern, come out for a brief moment (as someone said – not like Free Willie), then settle back to the bottom on her keel, and at sunset to be lifted out with straps and harness installed on the gunwales while under water by the divers. 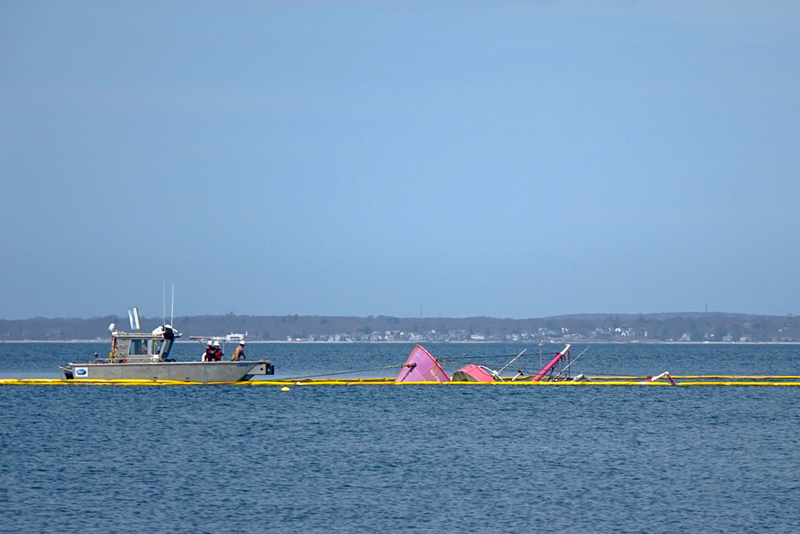 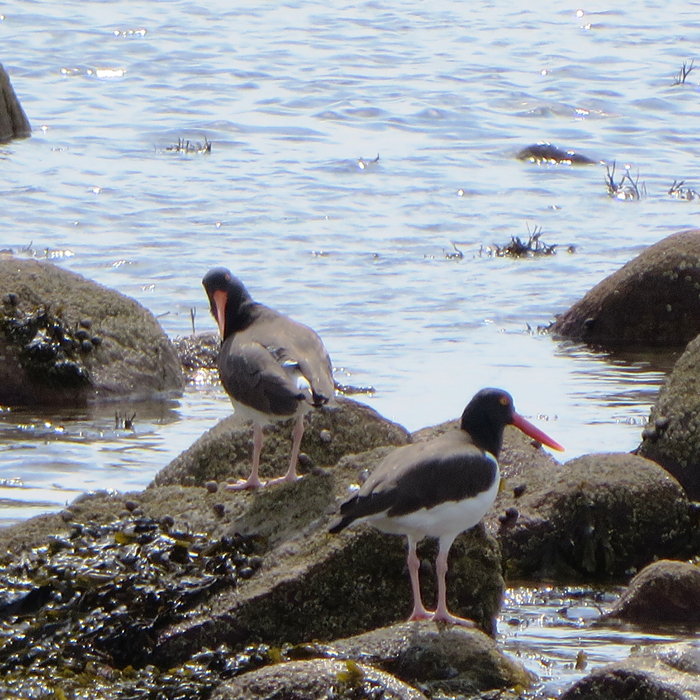 Photo Credit Jane T. Ahrens. 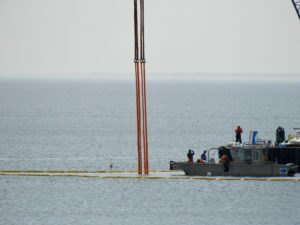 Click to view larger images of any on this page. 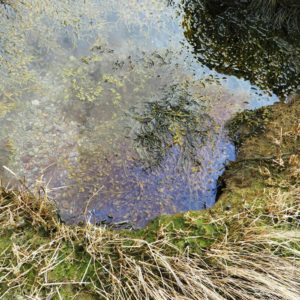 It’s such a delicate and critical habitat that even outside of a fuel spill, needs constant stewarding, so I feel the need for documenting. 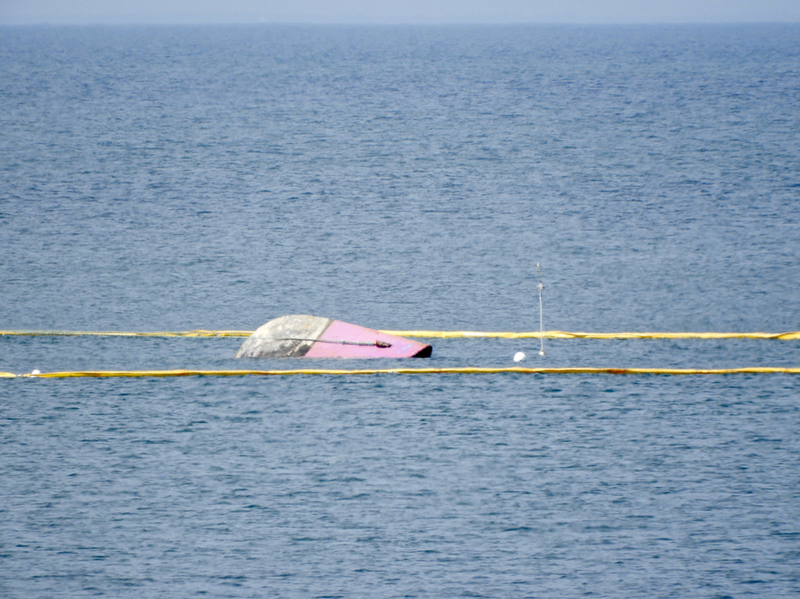 Still, after this time there are rainbow colored fuel sheen pockets within the healthy wrack line and rocks. 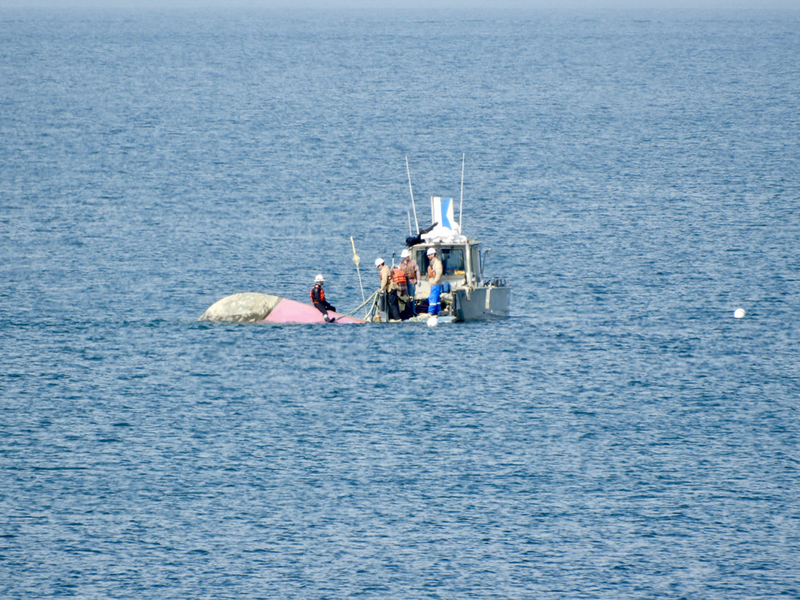 The entire shoal of Big Stony is a perfect example of unique marine ecosystems. 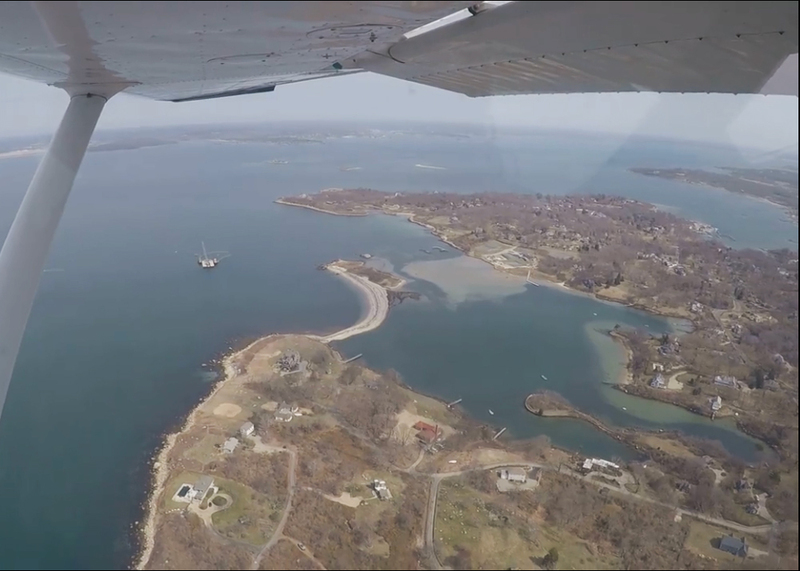 One minute you can see Bald Eagle overhead, Osprey carrying menhaden fish, wading Willets and Dowitcher shorebirds; like the rest of us feeling Fishers Island is their safe place to return to.